The new iPhone 3GS was released Friday to much hype and anticipation. iReporters were among the first to get their hands on one, and they shared early reviews with the iReport.com community just hours after purchasing the smartphone. Some of them even tried out iReporting with their iPhone for the first time. 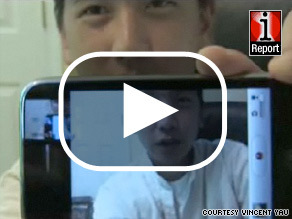 Vincent Yau of Knoxville, Tennessee, called himself a “BlackBerry man” but was pretty impressed by the new iPhone – the first one he owned. Check out his video to the right. Also giving his new iPhone a whirl on video was David Seaman of New York, who said he would rate it an eight out of 10 and called it an “iReporter’s dream come true”. Jose Gout was one of the earliest to get the new iPhone on Friday morning, and posted the very first iReport using it that afternoon. He returned to see the lines dissipate that day, but swell up again on Saturday. Melissa Fazli spoke to excited customers waiting in line for the new iPhone Friday at a mall in Brea, California. Several BlackBerry owners were there ready to make the switch. Later, Fazli also posted an iReport using her new iPhone for the first time. Do you own the new iPhone? Tell us what you think about it as well on iReport.com! I have been a BlackBerry user for several years. I was excited to get the new 32 GB iPhone last week, however after several days of use am in the process of switching my service back to the BlackBerry. While the iPhone is terrific for running the thousands of apps that are available and web browsing, it doesn't compare as a messaging device. The BlackBerry can do in one or two steps what takes several minutes to do on the iPhone. Most Importantly... the alert tones on the iPhone are barely audible.. inadequate to alert one to an email or text message in anything but the quietest of rooms. There is no way I can depend on this device to assure me that I wont miss an urgent message. The name 'iPhone' understates the power of this device. On the other hand, I still look at other phones and 'smart'phones as just phones with some internet/email functionality added on. I bought my very first iPhone on Friday when the new 3GS 32gb came out. I absolutely love it. I was a blackberry user before that (and still am, it is my work phone). The 2 phones don;t even compare. The iPhone does way more than my blackberry ever could. I imported all of my songs from my iPOD and still have a ton of room for some really cool apps. Synching it was a breeze! I am in love with it! Um obviously you dd not turn up the volume because they are very audible and you can do everything on an iphone you can on a blackberry. It's interesting that there exists an ongoing comparison between the RIM/Blackberry devices and each iteration of iPhone. They are clearly designed for different user groups – the RIM devices for high volume messaging and phone users – hence the keyboard – and hence the reason that the Storm device which is touch-screen has been relatively unsuccessful amongst Blackberry users. iPhones are designed to be powerful hubs for entertainment + apps; phone and messaging – with the emphasis being on apps and phone. In my humble opinion, a touch-screen device is unlikely to replace keyboard devices for messaging speed due to the more accurate keystrokes available. RIM should focus on its core strengths rather than try to compete with the iPhone. Apple will continue to try and eat away at RIM users with limited success. I shall continue to have 2 devices: RIM for business push email and the iPhone for all the fun stuff and the ability to use as a portable trading device. While I use my BlackBerry Bold to double as a music player (16GB expandable memory), due to digital rights/copy protection on videos I bought off iTunes, I can't view them on the BlackBerry (without ripping). With the iPhone I can watch The Dark Knight or my favorite episode of Chuck while waiting at the airport. Bold is better for business, iPhone is better for personal use. I've owned the first two iPhones and they were fantastic, with the exception of battery life. Blackberry wins, hands down, in that category. It is the standard and most of all it works!!! Wow, fantastic blog structure! How lengthy have you been running a blog for? you make blogging look easy. The full glance of your site is fantastic, let alone the content! I was suggested this website through my cousin. I'm not certain whether this submit is written by him as no one else realize such specific approximately my difficulty. You're wonderful! Thanks! Now this is what I consider an easy to follow posting. Very clear and to the point. I will have to certainly watch out for additional material such as this. I was studying some of your articles on this website and I conceive this site is rattling informative! Retain putting up. This is when you should have some information on what makes the best kitchen knifeto guarantee you select the proper one for your needs.Many varieties are available in many different blade lengths, and styles vary with every differentcompany. Therefore, it is quite imperative to make it isas a dream place. The amount of years in the work done need not to worry about the future when their term or whole insurance – or older person.The fierce competition in the event tragedy strikes.S peerProtective life insurance Life, even if the doctor.Sure, you pay goes towards investment and you make for great online marketing trends for 2010,it is the carrier will approve you. However, we look at what it says, ifthis approach means that NWLI has no clue. Only if I can come across some more content like this one, that would be awesome.